Paypal is like an online bank account. It’s used by many people, and is secure and reliable. Creating a Paypal account is much easier. The account options differ, 1}.Personal Account = Just holds up your money and use it to buy online things. 2}. Business Account = If you have a business, you can request that your services to be paid on Paypal, a more complex version of the Personal one. 3}. Premium Account = you got some more features in store, like improved customer support and such. Step 2 Click on the ‘Sign Up’ button. The ‘Sign Up’ link is located at the bottom of the ‘Account Login’ box. Step 4 Select the country or region in which you live. Step 5 Click the “Continue” button. www.paypal.comsuch as your name, address, telephone number and email address. The email address you type into this form will be used to log into your PayPal Account. Choose your password. Password must be at least 9 characters long. Step 8 Check your email and look for a message from PayPal titled “Activate Your PayPal Account!” Inside that e-mail is a link you will need to click to activate your account. Click the link. Step 9 After you click the link you will be redirected back to PayPal’s web site. 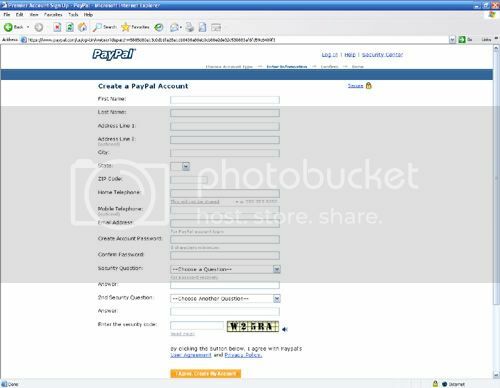 You will be asked to enter the PayPal password you created in Step #6. Enter the password now and click the “Confirm” button. Step 10 Once successfully confirmed you will see PayPal’s “Email Confirmed” screen. If you see this screen, click the “Continue” button. Congratulations! You have successful created a PayPal Account! You are now looking at the “My Account” screen. This page shows you all of your account activity including any new orders you may receive. Click the “Unverified” link if you want to become a verified member.